She said that natura is like Avon, where it is sold by a representatives. One of the most popular brand in Brazil and in other parts of South America because they are made with quality, uses part natural ingredients and affordable. Natura is a brazilian company which is a beauty brand with a purpose and a conscience. We believe in stating our beliefs clearly and sharing them. We find this is a good way of staying true to them. Bem Estar Bem. Translated literally from Portuguese this means well-being/being-well. It means that Natura strives, through its products and services, to help people enjoy better relationships with themselves (well-being), with others, with nature and the world around them (Being well). Life is a chain of relationships. Nothing in the universe exists alone; everything is interdependent. We believe that it’s only by recognizing the importance of relationships that we can achieve peace, solidarity, and pleasure, in all aspects of life. natural science dealing with your hair. 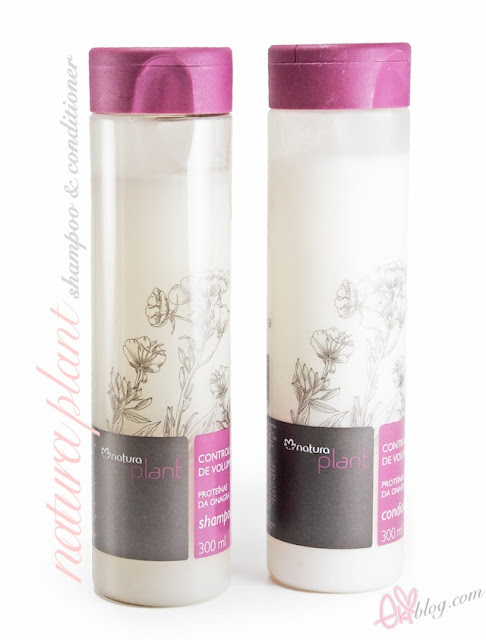 Plant is a natural product line for the daily care of the hair. A brand that plunged into the wealth of botanical diversity to gather, with the highest technology, assets and nutrients more effective, whether in a formula that is so specific needs of each hair. This line comes in different hair needs, I got the volume control version. I tried to find the ingredient list about it was hard to find in english since it was all in Portuguese,, sorry for the minimal infos on this product. 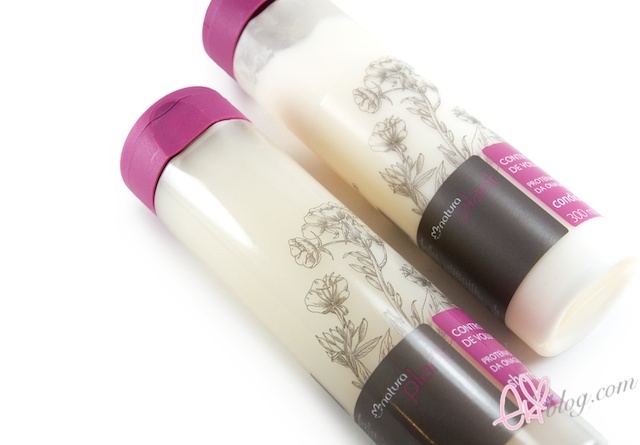 I really like the sleek design of the bottles, the scent smells great like a sweet floral. The first time I used this product it was because I forgot to bring my own hair products when I stayed over zachs parents house and Gabi happen to let me use her stuff from Brazil. I have very oily scalp/hair and this product washed out my hair really well without stripping my hair the conditioner felt very moisturizing, right after jumping out of the shower I noticed that my hair smelled so nice! once I dried my hair and ran my fingers through they felt silky and smooth just loved how it made my dry chemically processed hair felt like a virgin hair again! I raved to Gabi how nice my hair feels and thats when learned about this brand natura from Brazil. I have been using this shampoo & conditioner for over a month I can definitely feel that my hair feels even more moisturized, shiny and manageable. Great quality and affordable, I just wished that they had a branch here is the US. I love Natura products, but since I moved to Japan [I'm brazilian lol], I don't use it anymore :( too expensive here. I have tons of Natura products, they make the most amazing body creams! I live in Argentina so it's pretty easy to get it. But basically they said the active ingredient is the "onagra protein"
I'm from Mexico and I can help you get them if you want to :D There's a natura distribution center 2 blocks away from my home and I always go there! I personally love their hand creams, they smell amazing! Everything from Natura is really good! U have to know others products... im sure u ll like! I use the purple one, for straight hair, and i love it! just send me a e-mail. I would love to know where to get this in the US too^^! Great review, I wish this was widely available in the US as well! I am here in Brazil where I live and there are many dealers of Natura! I love hair care of Natura! You should try the body care line too. you should definitely try the natura ekos line. It's much more organic than the natura plant one. I love the cocoa shampoo and conditioner. I have tons of Natura products, they make the most amazing body creams! The Best Western Hotel fills their dispensers with Natura shampoo and conditioner. I LOVED it and my hair still smelled really good the next morning from using Natura the previous day! But where can I purchase this product? I've just downloaded iStripper, and now I can watch the best virtual strippers getting naked on my taskbar.